Vanicream skin and hair care products are specially formulated for skin allergies and sensitivities! 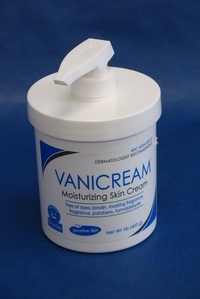 Vanicream Skin Cream 4 oz. 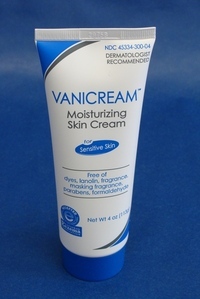 Vanicream Skin Care Cream is a non greasy, long lasting moisturizing cream with many versatile applications. It can be used for long lasting hydration, prescription compounding and physical protection. Vanicream does not contain any perfume, formaldehyde, lanolin, parabens or dyes. Both the cream and the lotion can be used before exposure to wind or cold to protect sensitive skin. Physician recommended for over 20 years! Vanicream Skin Cream 16 oz. - In an economical and convenient pump dispenser! Same great product. Pump dispenser makes for easy daily use. 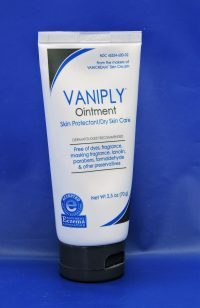 Vaniply Ointment/Skin Protect provides a soothing and protective cover for the skin-keeping skin hydrated longer! A gentle and effective ointment that forms a protective film on the skin which helps to retain the skin's moisture. Reccomended by The National Eczema Association. Vanicream HC Cream 2 oz. A non-greasy, easy to spread anti-itch cream for sensative skin. Maximum strength provides relief for flair-ups due to eczema, dermatitus and psoriasis. It does not contain any perfume, formaldehyde, lanolin, parabens or dyes. 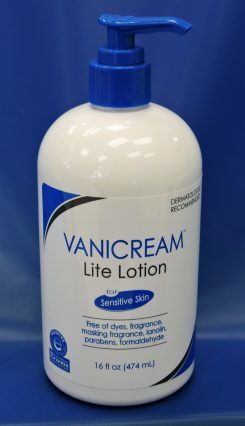 Vanicream Lite Lotion 8 oz. Vanicream Lite Lotion - Lighter feel in the same great formulation of main ingredients! Vanicream Lite Lotion has all of the benefits of the cream in a convenient lotion formula. Great for frequent use. Non staining with no greasy after feel! Use after bathing, swimming or sun exposure for relief of dry or sensitive skin. 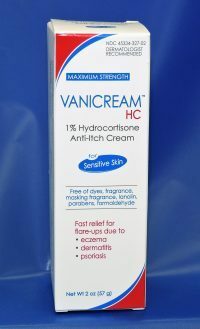 Vanicream Skin Cream and Lite Lotion has proven to be beneficial for skin problems such as atopic dermatitis, psoriasis, ichthyosis and eczema. .
Vanicream Lite Lotion 16 oz. Vanicream Lite Lotion - A Larger and Economical Size! 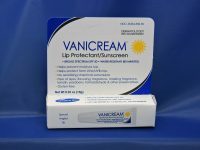 Vanicream Lip Proctect and sunscreen all in one! Vanicream Lip Protect helps prevent and relieve chapped lips. Broad spectrum protection SPF 30 and water resistant. Protects from damaging UVA and UVB rays. Vanicream Cleansing Bar 3.9 oz. Vanicream Cleansing Bar - The totally non-irritating soap! Vanicream Cleansing Bar has been developed for people who need or want to avoid common chemical irritants found in ordinary soaps. The bar has been enriched with Vanicream Skin Cream to moisturize while gently cleansing the skin. Ideal for daily use with a competitive price. Vanicream Z- Bar Medicated Cleansing Bar 3.36 oz. Vanicream Z-Bar Medicated Cleansing Bar with 2 percent Pyrithione Zinc! 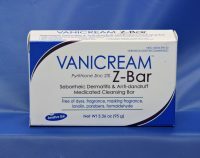 Vanicream Z-Bar Medicated Cleansing Bar has 2 percent pyrithone zinc to help relieve seborrheic dermatitus and dandruff. A mild and gentle formula for those who want a soap-free zinc cleansing bar that is free of common chemical irritants. 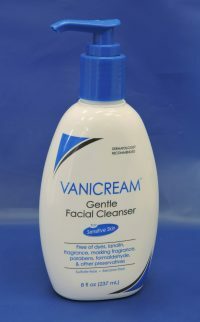 Vanicream Gentle Facial Cleanser 8 oz. Vanicream Gentle Facial Cleanser leaves skin feeling soft and clean! Vanicream Gentle Facial Cleanser cleans your face without drying your skin. Leaves skin feeling clean and soft. Non comedogenic (won't clog pores) and fragrance free. Ideal for skin associated with eczema, psoriasis, ichthyosis or winter itch. 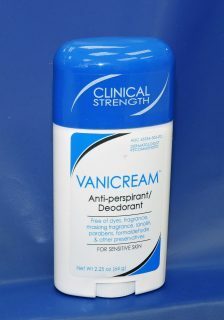 Vanicream Anti-perspirant/Deodorant for effective protection up to 24 hours! Vanicream Anti-perspirant/deodorant is a fragerance-free formula for sensative skin. Scent free, no masking fragrance, no botanical extracts. Clinical strength - 24 hour effective protection. Leaves skin feeling soft with a smooth, dry application. 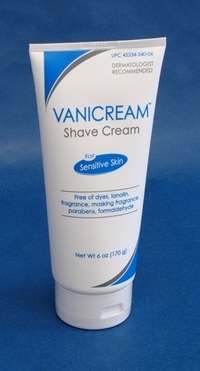 Vanicream Shave Cream 6 oz. Vanicream Shave Cream - Shave without irritating sensitive skin! RoBathol Bath Oil 16 oz. RoBathol Bath Oil 16 oz. bottle - A critical part of eczema treatment! 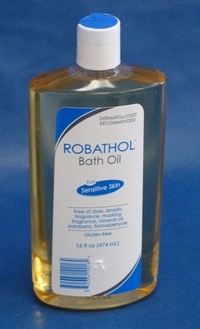 RoBathol Bath Oil is a cottonseed based oil that soothes, lubricates and moisturizes dry, chapped or irritated skin. Designed for use in the bath or shower, RoBathol contains none of the common chemical irritants found in ordinary bath oils.A great alternative to help keep your skin flexible and resilient. Great results with eczema! Several years ago one of our Allergist friends told us how she uses Robathol as part of her treatment regimen for eczema patients. It is really very simple. Bathe the eczema patient in a tepid water bath and one capful of Robathol. Do not use hot water or conventional soap. After the bath, pat the skin dry and slather with Vanicream lotion. Repeat daily. We have had many customers use this approach with great results. Vanicream Liquid Cleanser 8 oz. Vanicream Liquid Cleanser - Safe, Convenient and Non-Allergenic! Vanicream Liquid Cleanser is the perfect product for every sink in your house. Convenient pump dispenser. Irritant and allergen free formulation safe for the whole family and all skin types. Soap free. Oil free. None of the common chemical irritants. Vanicream Liquid Cleanser 32 oz. 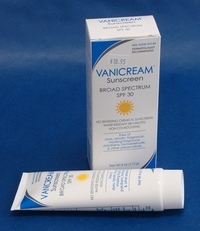 Vanicream  Sunscreen SPF 30 4oz. Tube - Safe, non-irritating, protection from the sun! Vanicream Sunscreens offer protection from the sun and harmful UVA rays that contribute to skin damage and premature aging of the skin. SPF15 and SPF35 are free of preservatives, PABA and benzophenones and are formulated with transparent zinc oxide. Vanicream suncreens are very water resistant, oil free, odorless, non greasy and long lasting. 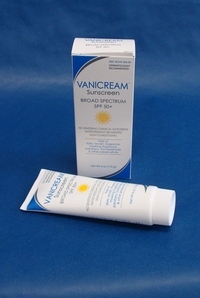 Vanicream  Sunscreen SPF 50+ 4oz. Tube - sun-blocker strength! 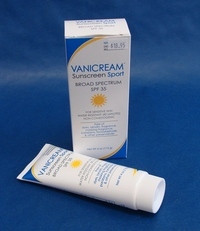 Vanicream Sport Sunscreen SPF 35 4oz. Tube - Designed to protect when you perspire! Vanicream Sport Sunscreen is the perfect product for active people. Long lasting protection. Free & Clear Shampoo 12 oz. Free & Clear Shampoo 12 oz. - Leaves your hair soft without damaging chemicals! 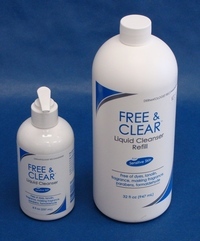 Free & Clear Shampoo and Conditioner are gentle yet effective. Dermatologists and allergists recommend these products to their patients. The hypo-allergenic choice with no perfume, lanolin, formaldehyde, parabens, dyes or proteins. Ideal for daily use, the shampoo has a rich lather, and the conditioner helps prevent tangles and hair breakage. Recommended for all hair types including permed and colored hair! Free & Clear Conditioner 12 oz. 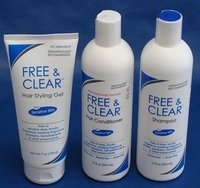 Free & Clear Conditioner 12 oz.- The safe companion hair product! Free & Clear Hair Spray Firm Hold, 8 oz. 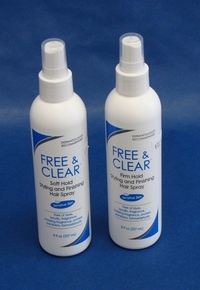 Free & Clear Hair Spray - Keeps your hair in place without the cloud of fumes! Free & Clear  Hair Spray was created for people who want or need to avoid common chemical irritants found in ordinary hairsprays. Safe for sensitive skin. The firm hold allows firm styling control with a long lasting, natural looking hold. Free & Clear Hair Styling Gel - Long lasting control without common chemical irritants! The folks at Pharaceutical Specialties continue to meet the needs of their allergic customers. Their new Hair Styling Gel meets their standards for people with sensitive skin and scalp. Listen to this - no alcohol, no dyes, no fragrance or masking fragrance, no formaldehyde, parabens or other preservatives and no lanolin. This Dermatologist and Allergist recommended product provides firm, long-lasting control. It helps nourish and repair damaged hair, reducing the formation of split ends. 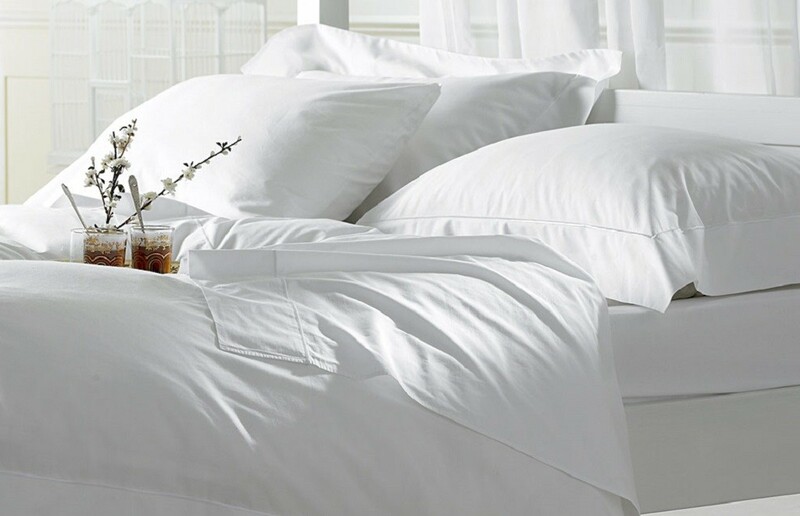 It helps to reduce flakiness and controls static while adding fullness and volume. It is not sticky and leaves hair feeling clean and manageable. Another great product. There is no need to settle for less because of your sensitivities.